Explanation: After the latest round of discovery announcements, the list of known worlds of distant suns has grown to 50. While extrasolar planet discoveries are sure to continue, none - so far - points clearly to another planetary system like our own. Take, for example, the newly discovered parent star HD38529. Shining in Earth's night sky at 6th magnitude, this sun-like star lies 137 light-years away in the constellation Orion. Like most of the known extrasolar planets, HD38529's planet was discovered by detecting the telltale Doppler wobble in the parent star's spectrum. The data reveal that this planet orbits once every 14.3 days at an average of only 0.13 times the Earth-Sun distance and has a minimum of 0.77 Jupiter masses (about 240 Earth masses). There is even evidence in the wobble data that HD38529, and other stars with one known planet have additional massive planets orbiting them. In this dramatic artist's vision, HD38529 and its newfound world are viewed from the moon of another massive ringed planet orbiting farther out. 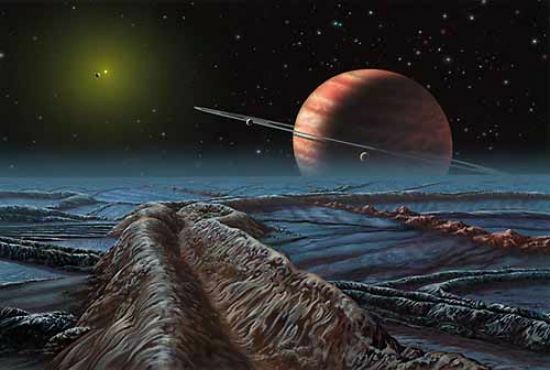 The ringed planet's moon is imagined to have a thin atmosphere and a surface covered with icy sheets and ridges similar to those found on Jupiter's moon Europa.